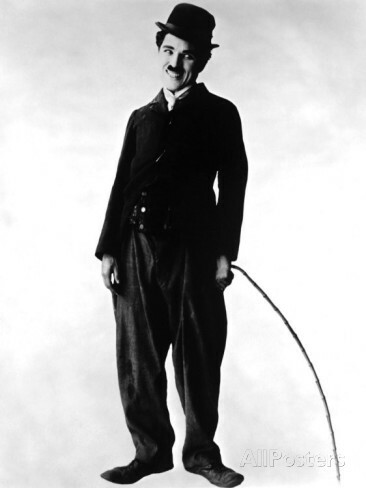 The tramp, whose clothes Charlie Chaplin first donned in 1914, is unmistakeable even now. His face has a small moustache, his clothes don’t fit. His coat is too small, his bowler hat is too tight on his head and his trousers are permanently slipping towards the ground. Wearing oversized shoes and armed with a flexible cane he stumbles courageously and seriously through an adventurous life. He is going nowhere, nor has he come from anywhere. He exists only in the now. If he feels lonely, he hugs trees and if a child is hungry he steals bread. The tramp is no stranger to badly-paid jobs jobs, and can adopt the form of a woman or a priest if the situation requires. Despite his later wealth, Chaplin never forgot his childhood in the poorhouse. His films were always made for the great majority of people who own nothing. His sublime tales will always bring you to tears of laughter and of despair. They can be understood everywhere, because the everyday fight for survival is universal and requires no language. Chaplin was an expert mime, a superb dancer and acrobat, and no-one could disappear jackknife-like into a wooden barrel as elegantly as him. This produced a special humour that was nearly impossible to put into words. In the early short film “Work”, we see Chaplin as a decorator’s apprentice. On the way to his next job, he must drag his boss up a steep slope in a cart like a donkey. The boss is soon accompanied in the cart by a friend. When they reach their destination they see the decorators as potential thieves and hide their money. At the end, the whole house sinks into chaos – and is drowned in white paint. Chaplin worked with unconventional methods. Starting with an idea for a sketch, he improvised without a script and developed the film in front of the running camera. This spontaneity produced an inimitable dynamic. Yet behind the slapstick in Chaplin’s comedies there was always social criticism. Revered professions were ridiculed – for example in “Police” where a priest is also a pickpocket who takes the last money from Chaplin’s former prisoner. This film also shows the scandalous conditions in a shelter for the homeless. After 3 years experience of making short films, Chaplin’s first “full length” film was the forty-minute “A Dog’s Life”. Here he compares the situation of an unemployed man with that of a stray dog. As the dogs hunt for bones, masses of people hunt for a job, which will only of them will ultimately receive. During his life, Chaplin made more than 80 films. In 1919 he started the independent film company United Artists with his acting colleagues Mary Pickford and Douglas Fairbanks, giving him more time to make his films. In 1921, Chaplin made his first major film “The Kid”. Jackie Coogan plays a foundling who is brought up by the tramp. As the authorities learn that the tramp is not the biological father, the 5-year old boy is taken from him. He is too poor to bring up the child. The film has autobiographical elements – Chaplin spent part of his childhood in an orphanage and a poor house. His mother was destitute, became mentally ill as a result of her living conditions, and was sent to an asylum. Chaplin only escaped this life by getting paid work as an actor. In the 1920s and early 1930s, Chaplin continued making silent films about the destitute tramp. In “The Gold Rush” (1925), the starving tramp must eat his shoes to survive. In “City Lights” (1931) he must find money for an eye operation for a blind flower girl. He receives the money from a millionaire, who is the tramp’s best friend when drunk but never remembers him when he is sober. Chaplin’s next film “Modern Times” took 3 years to produce, from 1933 to 1936. By now, Chaplin was making explicit social commentary. He originally wanted to call the film “The Masses” after a socialist newspaper. In the opening sequence – a montage of ticking clocks, a sheepdog and workers – it is already clear that this film promises more than Chaplin’s earlier comedies. He joined the demand for a shorter working day and a minimum wage. “Modern Times” pillories the dulling effect of the assembly line, using hyperbole to get to the core of the problem. Chaplin accurately caricatures the permanent pressure to increase work efficiency, showing machines as being instruments of force feeding. Workers are only a disruption to the production – the factory owner regrets that he can’t do without them entirely. The tramp suffers the madness of the factory and is sent to jail. On the way there he accidentally becomes the leader of a workers’ demonstration, as he carries a red flag that has fallen from a car. This famous scene is very important, as Chaplin doesn’t just show how workers live, but also how they can consciously go onto the streets to fight for their interests. In some countries, this part of the film was cut. “Modern Times” is also the first film which contains a female figure who interacts with the tramp from an equal level. Chaplin came relatively late to the new genre of sound films. Yet his first such film is a Meisterwerk in polemic. “The Great Dictator” was released in 1940. The actor and director was enraged by Hitler’s inhumane politics, not least because Hitler looked like a bad copy of Chaplin – something that Chaplin utilised for satirical effect. In the film he plays a dual role of Hitler alias Anton Hynkel and a Jewish barber who lives in the ghetto and is being persecuted by the Nazi regime. Many friends and politicians advised him against his idea for a film, but Chaplin wasn’t bothered about possible financial losses. He just wanted to unmask Hitler politically. The Nazis had declared that Chaplin was really a Jewish communist called Karl Tonstein. Chaplin is alleged to have replied by saying “I’m afraid I don’t have that honour”. Although this may have been an embellishment added to Richard Attenborough’s biographical film, there is no doubt that Chaplin was a committed anti-fascist – at a time when Russia still had a political pact with Hitler’s Germany, and most US politicians were issuing very ambiguous statements. For this reason alone, adding the speech for peace and humanity at the end of “The Great Dictator” was a courageous act. This speech is often understood to be simply an attack on Hitler. In fact it is an anti-capitalist plea for a new society – also in the USA: “Greed has poisoned men’s souls, has barricaded the world with hate, has goose-stepped us into misery and bloodshed […] Let us fight for a new world – a decent world that will give men a chance to work – that will give youth a future and old age a security.” As a result, Chaplin was invited to the White House, where the US-American president Franklin D. Roosevelt accused him of endangering trade with Argentina. In 1946 in “Monsieur Verdoux”, Chaplin played a murderous con artist. In this satire, he denounces the military and weapon industry which kill masses of people with impunity, while an individual murderer is seen as being morally corrupt and jailed. The US-American government suspected Chaplin of being a Communist. He was threatened three times with being brought before Senator Joseph McCarthy’s House of Unamerican Activities Committee. He threatened to go to the trial dressed as the tramp. As the Briton had never taken up US American citizenship, the State then tried to revoke his residency permit.